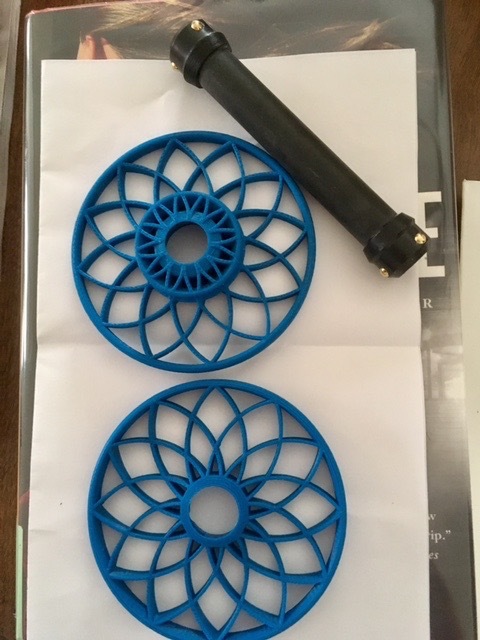 The bobbins are not cheap, but they are affordable and come at a price that is comparable to (and often a little less than but sometimes a little more than) the OEM bobbins. But unlike the OEM bobbins, the Akerworks bobbins come apart so that they can be stored flat, are totally customizable with 20 colors and 6 whorl patterns from which to choose, and are virtually silent when in use. 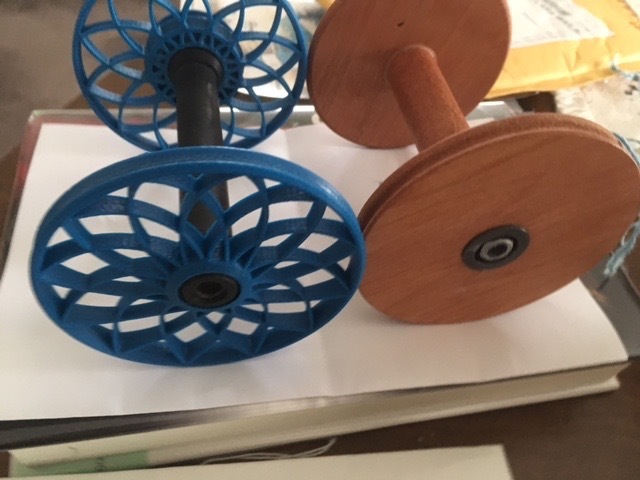 After each model bobbin is designed and developed, it is then tested by spinners. The bobbin isn’t offered for sale until it receives passing marks from the test spinners. 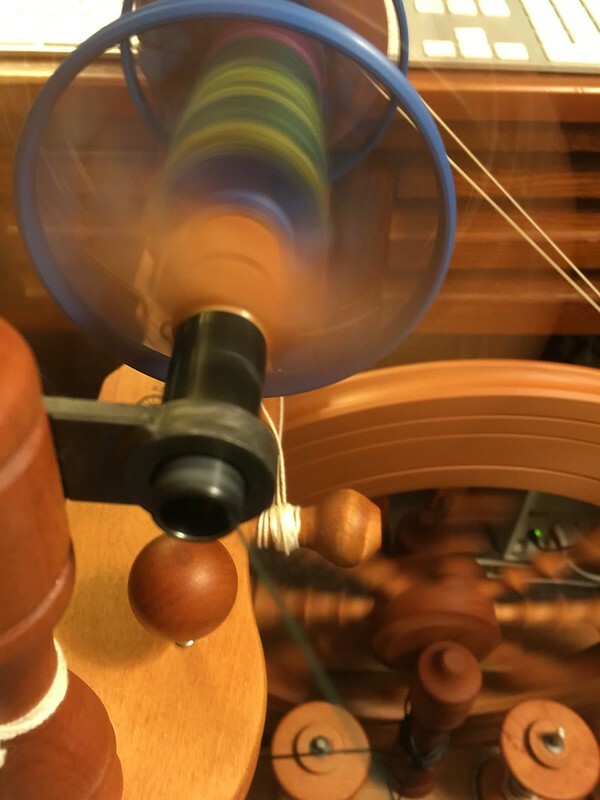 I was lucky enough to be chosen back in October to test spin the newest Akerworks bobbin, a double drive bobbin for the Ashford sliding hook flyer. 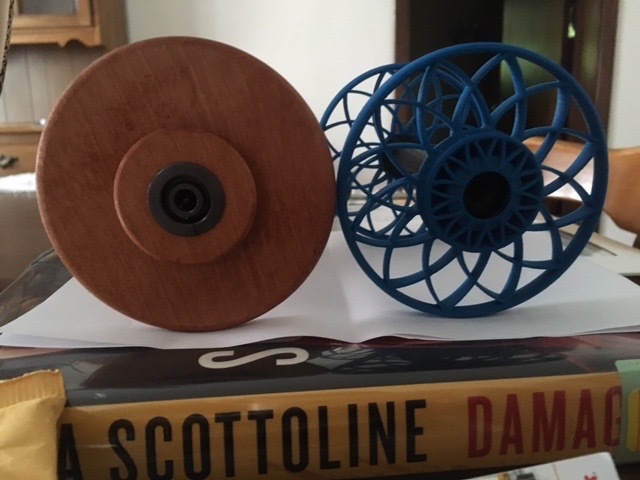 After using it to spin in double drive and ply in Scotch tension, the bobbin got an A+ from me. It is totally silent as it spins on the shaft of the flyer, and it is very smooth. I highly recommend this bobbin to anyone who has an Ashford sliding hook flyer. Here’s my review, in pictures and captions. Enjoy! 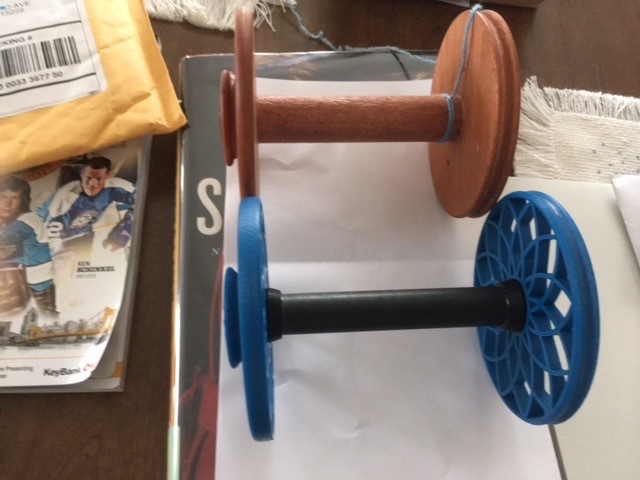 The bobbin arrived in a small padded mailing envelope. 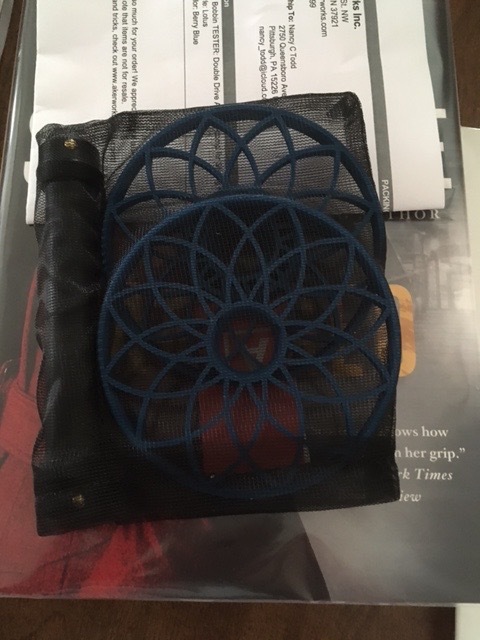 The bobbin comes in a mesh pouch with a separate compartment for the core. The flat-pack design means the bobbins take up much less space when stored or packed for traveling. Two whorls and the core. They fit together easily and stay together until you decide to take the bobbin apart. Akerworks has a video on their web site/YouTube demonstrating how to assemble and take apart the bobbin, but to be honest, it is totally intuitive. I didn’t discover the video until I had put together and take apart the bobbin several times. 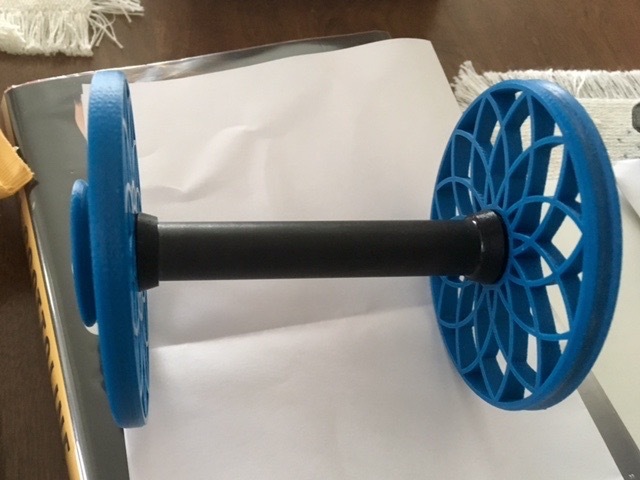 Here’s what the bobbin looks like once it is assembled. Mine is the Lotus pattern in Berry Blue. The core is carbon fiber. The Akerworks bobbin is just a hair longer than the Ashford Sliding Hook Flyer bobbin, and the core has a slightly smaller diameter, so you can get more yarn on the Akerworks bobbin than on the Ashford bobbin. This is the end with the big pulley. Normally I would use the large end for spinning in Scotch tension, but I’ve never been able to get that to work on my Traveller with the Ashford bobbins. I just put the brake band over the small end, and I use a cotton brake band instead of the nylon band the Ashford comes with. I did the same thing with the Akerworks bobbin, and it worked well. This is the end with the small pulley. I love the openness of the Akerworks bobbin. 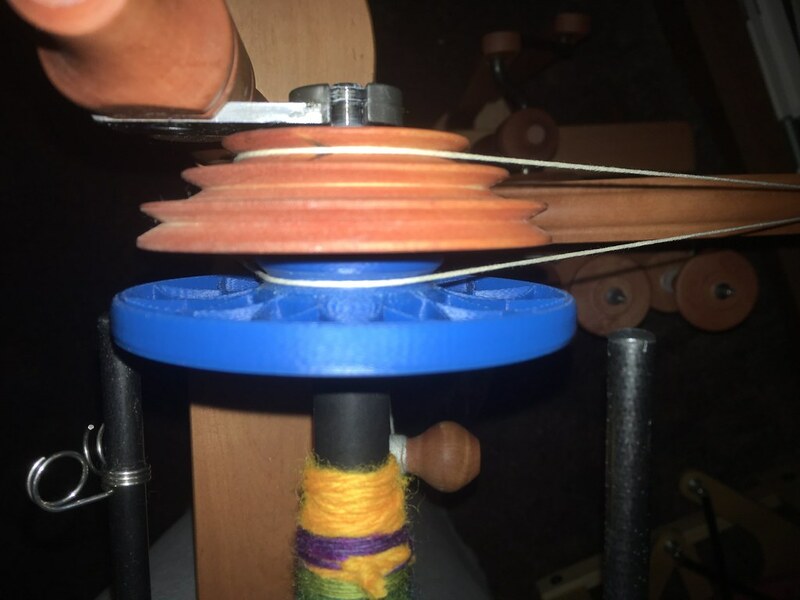 Here’s my Akerworks bobbin set up in double drive on my Traveller using the smallest pulley on the sliding hook flyer whorl. The gold yarn on the bobbin is the leader. 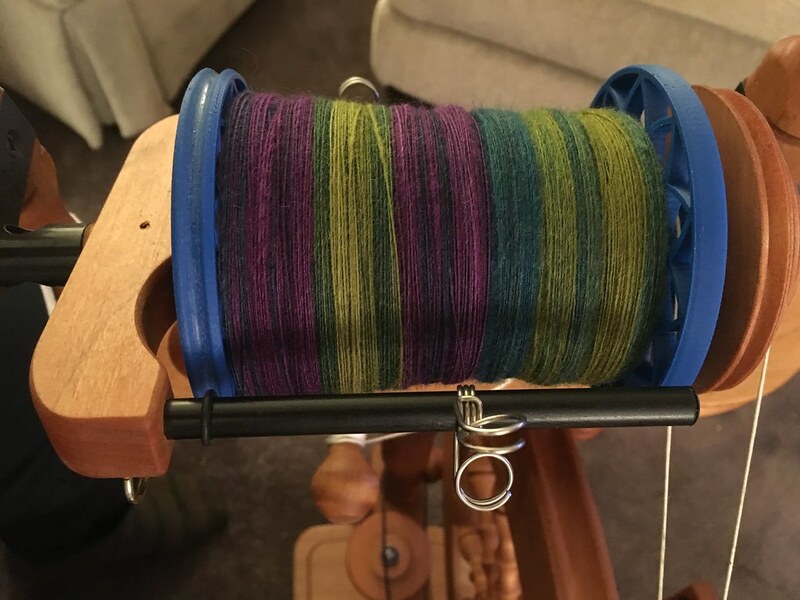 The purple and green are the yarn I was spinning. The bobbin looks quite lovely on the spinning wheel. I think the blue goes very nicely with the cherry finished of the NZ silver beech of the Travvy. An added bonus of the Akerworks bobbin is that when the bobbin is spinning, you can actually see through it. No more excuses for forgetting to move the sliding hook. Seriously, this makes it much easier to get a nice, even bobbin. 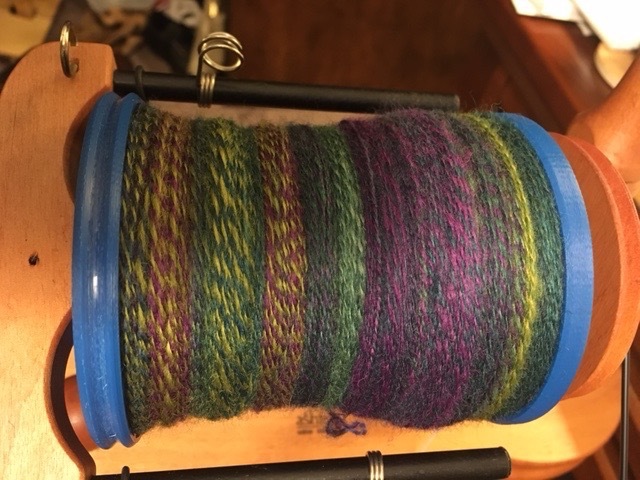 Because this bobbin is so big, I was able to spin a 4-ounce bump onto it with tons of room to spare. I could have easily fit 2 more ounces on this bobbin. I used the Akerworks bobbin in Scotch tension to ply the singles I had spun. The yarn is a 2-ply spun from both ends of a center-pull ball. The bobbin is nearly full, but there is still room for more yarn on it. These bobbins have a good capacity; they will hold a little bit more than the Ashford Sliding Hook Flyer bobbins, which are nice big bobbins in their own right. 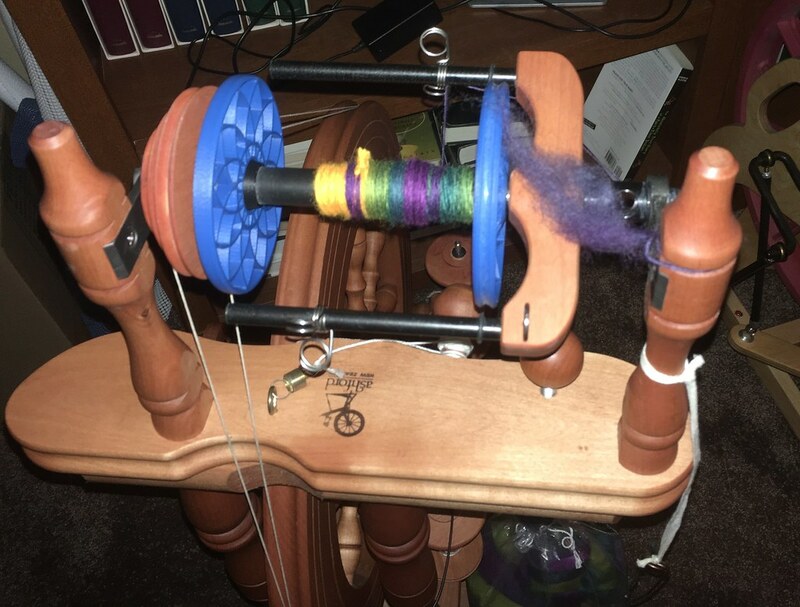 If you have been thinking of purchasing Akerworks bobbins for your spinning wheel, do it! This entry was posted in Spinning and tagged Akerworks, Ashford sliding hook flyer, Ashford Traveller. Bookmark the permalink.